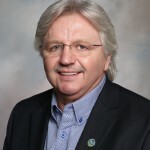 Thiele began serving a one-year term as IPPA president in January 2019. He is a partner in KMAX Farms, LLC, in Howard county, where he manages 19 KMAX finishing barns in a wean-to-finish hog business that markets 60,000 head a year. He also helps with the farms’ 3,500 acres of corn and soybeans, while managing his own 80 acres of corn and soybeans and 100-head cow herd near Elma. Trent’s active at the county fair with grillings and pork promotion activities and helps with hog show weigh-ins. This eastern Iowa producer has a farrow-to-finish hog business near Walcott and markets 22,000 head annually. Paustian Enterprises also has 2,400 acres of corn and soybeans. Mike attended Iowa State University, majoring in microbiology. He received a Ph.D from the University of Minnesota. Paustian was first elected to the board in 2015. 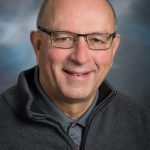 Hora completed his one-year term as president of the Iowa Pork Producers Association in January 2019. 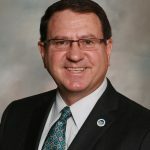 He was first elected to the board in 2014. He finishes 27,000 hogs per year and farms nearly 2,000 acres of corn and soybeans. 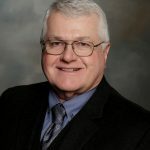 A long-time member of the Webster County Pork Producers, Gregg has been active on the county grilling and media team and participated in many pork promotions. Hora has been active as a volunteer at the Iowa Pork Tent at the Iowa State Fair. Dwight is a partner with several family members in Mogler Farms/Pig Hill in Lyon County. They have 3,000 sows and market 90,000 pigs wean-to-finish per year. The farm enterprise also includes 2,500 acres of corn and soybeans. He was named a Master Pork Producer by IPPA in 1982 and he received the Pork All-American Award in 1997. 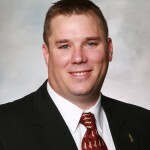 Mogler is a graduate of Iowa State University with a major in agricultural business. Rasmussen has KLR Pork, a farrow-to-finish swine enterprise that markets 20,000 hogs a year. Another 6,000 are sold as weaned pigs. He also raises 1,100 acres of corn each year. Humboldt County doesn’t have an organized pork association, so Kevin and his wife, Lisa, have taken it upon themselves to promote pork and the industry in the county and tell their story to civic groups and other organizations. 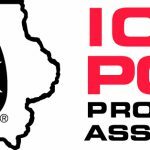 Kevin has actively served on various IPPA committees. He is a Master Pork Producer and the Iowa Farm Bureau once named Kevin and Lisa the state’s Outstanding Young Farm Couple. In 2018, he was a national finalist for Pig Farmer of the Year. He studied agriculture and farm operations at Iowa State University. Dennis annually raises 2,500 to 3,000 hogs in a farrow-to-finish business near Essex in Page County. He also raises 2,500 acres of corn and soybeans. He was instrumental in re-organizing the Page County Pork Producers and he has served continuously on the county board, holding all offices. Dennis supports the Page County Fair by serving as assistant swine superintendent. Liljedahl has been honored with the Page County Hog Wild Award and he was named a Master Pork Producer by IPPA in 1994. He graduated from Iowa State University with a bachelor’s degree in animal science. Van Den Top owns Top Five, Inc., and raises 27,000 hogs a year in his swine finishing business in Sioux County. Four hundred acres of corn and soybeans round out his farming enterprise. 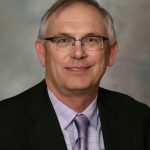 Marv is a member of the Sioux County Pork Producers Board of Directors. He is a 2014-15 graduate of the Pork Leadership Institute. His community involvement includes service to the Rock Valley Rural Water Board. Van Den Top studied business at Western Iowa Tech Community College in Sioux City. 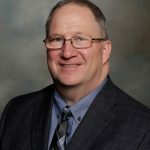 Tentinger is a past president of the Iowa Pork Producers Association. He has farmed and raised hogs near Le Mars in Plymouth County for nearly 50 years. He and his wife, Joan, run a farrow-to-finish business and have 350 sows that produce 7,200 pigs each year. They also purchase an additional 3,000 iso-wean pigs that are finished, increasing their total number of hogs marketed annually to 10,000. He feeds pigs from his corn and soybeans acres. 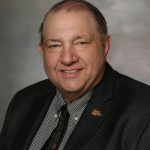 Bill is a member of the Plymouth County Pork Producers, the Iowa Soybean Association, American Soybean Association, Iowa Corn Growers and Farm Bureau. Dale and his wife, Laura, founded Reicks View Farms in the late 1970s near Lawler. As 5th generation pork producers, they began with 240 acres of corn along with 200 sows. The production system has grown over the years to include sow units, a boar stud, nursery and finishing facilities. Reicks View Farms prides itself on being a family farm. Dale and Laura, their two children and more than 150 employees and 40 production partners continue to farm corn as well as produce top quality pork. Jen is the communications director for Iowa Select Farms based in Iowa Falls. 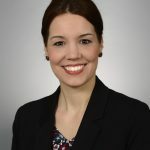 She currently oversees internal and external communications, including corporate, stakeholder and employee communications, branding/marketing support, community relations and issues management. She’s also active in government relations and public affairs. Iowa Select has 700 swine farms across the state, 180,000 sows and produces more than one billion pounds of pork annually, making it Iowa’s largest pork producer and the 8th largest in the U.S. Sorenson attended Iowa State University. The Cook family owns and operates their family farm, CBL Farms, in Buchanan County. They have 1200 sows producing 30,000 pigs annually, and finish about 15,000 per year. The farm also includes 200 acres of corn. In 2009 she and her husband Aaron were named Master Pork Producers, and followed that in 2010 as IPPA Pork All Americans. They have also received the Wergin Good Farm Neighbor Award. Trish is a 24-year member of the county pork producers and served as a county board member. She has actively hosted events at the farm to provide a transparent look at pork production. 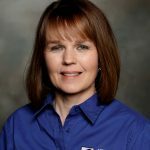 She has an accounting degree from Iowa State University and an MBA from the University of Iowa. .
Jason is a partner in AMVC Management Services in Audubon and director of grow-finish swine health. 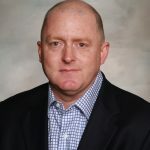 He manages 115,000 sows and 1.3 million market hogs in seven states for AMVC and serves as public relations lead for the company. 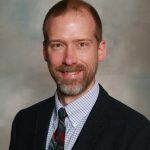 Dr. Hocker is a Williamsburg native who earned a bachelor’s degree from Coe College in 2001. 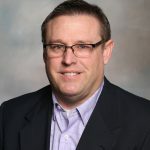 He continued his education at Iowa State University, earning a doctorate in veterinary medicine in 2005 and a master’s degree in veterinary microbiology in 2006. Hocker is a member of the Iowa and American Veterinary Medical associations and the American Association of Swine Veterinarians. In 2011, Jason was named to the Pfizer Animal Health “10 under 40” class. Mark and his wife, Wendy, farm near Protivin in Howard County. They have a swine finishing business and also raise crops. Meirick is a member of the Howard County Pork Producers, Iowa Corn Growers Association, Iowa Soybean Association and the Ag Business Association of Iowa. Mark has an ag/business degree from Iowa State University. Hogan has a 22,000-head swine finishing business at J & P Pork near Monticello in Jones County. He also raises corn and soybeans on 2,700 acres. James has been a member of the Jones County Pork Producers for 40 years. 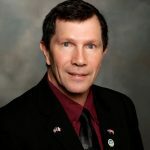 Hogan is a past 4-H leader, past board member of the Jones County Beef Producers, and served for 10 years as a member of the great Jones County Fair Board. James is a graduate of Kirkwood Community College. Ryan is the general manager of Prestage Farms of Iowa in Ames. 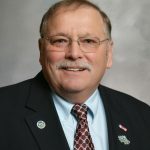 He belongs to the Story County Pork Producers and has served on the Iowa Pork Producers Association membership/Leadership Committee for five years. 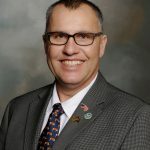 Pudenz has served as a National Pork Producers Council Pork Forum delegate for the past five years and been a Pork Act delegate for the National Pork Board for a year. He has twice attended NPPC’s Legislative Action Conference and he has participated in the Pork Leadership Institute. 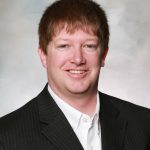 Ryan also serves the industry as a PQA Plus advisor and is on the Iowa Pork Industry Center Advisory Board. He is a member of the Iowa State University Iowa Swine Day Program Committee as well. Pudenz has a bachelor’s degree in animal science from ISU. Pat and his wife Diane own and operate a farrow-to-finish farm with 5,000 head in Jasper County. He also farms 2000 acres of corn and soybeans. He is a strong believer in family-owned hog farms and believes they are a safe and secure way for providing opportunity for young producers in the future. He is an Iowa State University graduate with a double major in ag business and agronomy. Matt and his family have a farrow-to-finish swine enterprise near Wellman. The Gents also raise corn and soybeans. He has been an Iowa Pork Producers Association delegate and was named a Master Pork Producer in 2015 by IPPA. 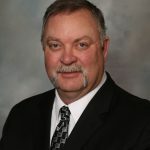 Gent has served on the Washington County Pork Producers Board of Directors since 2010, serving as vice president in 2012 and president in 2013. In addition to his pork relationships, Matt is a member of the Iowa Corn Growers Association. This position was formerly held by Mike Paustian of Walcott. Since Paustian was elected to the President-elect position in January 2019, the position is vacant until a replacement is elected. This is expected to happen in April 2019. Cavner is a Financial Officer for Farm Credit Services of America. He consults with pork producers in financing their operations with both short and long-term capital needs. Stan knows and has a passion for the swine industry. 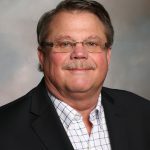 His career spans over 30 years with: Purina Mills as a Commercial Swine District Manager; APC Inc., as a Technical Sales Manager; then joining FCSA in 2004. He understands the swine industry from several fronts, production, nutrition, health, and finance. He holds a Bachelor of Science in Business Administration from Wayne State College, Wayne, Nebr. Raising pigs has been a life-long passion for Jarrod Bakker. He grew up on a farrow-to-finish pig farm and now, along with his wife, Shari, and brother, Jordan, owns Bakker Bros. Genetics, a 50-sow farm that markets 1,000 pigs annually. Bakker also works for Fast Genetics, where he sells breeding stock to farmers across the country. 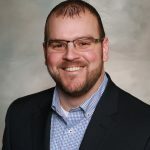 Schram works full time for Producers Livestock Marketing Association as a swine marketing agent and enjoys working with pork producers from across the Midwest. The Woodbury County farmer buys feeder pigs each year to feed and for his children to show as 4-H projects at the fair. He has served as a county fair swine superintendent and county fair pig supplier. 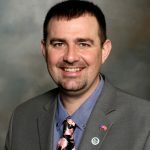 Jeremy has served on various state boards, including the Iowa Purebred Swine Council. He enjoys judging various swine shows across the region each year. Jeremy has an animal science degree from Iowa State University.